Marketing, the action of promoting and advertising products and services, has become a bigger challenge for businesses. Which channels to pick? How much budget to allocate? These are just some of the typical questions and challenges companies are facing. Both overwhelmed and stimulated by so many options, marketers must decide on how to best allocate their marketing budget and constantly test and revisit their approaches. The state of marketing is frequently changing and it is therefore imperative to keep up-to-date with the latest trends. Many studies/journals/reports are constantly being released and provide in-depth data and trends about your market supply & demand. These can be found online, offline, in libraries, and can be free or at a cost. Focus groups, surveys and questionnaires are good ways of getting data related to your own brand, however these options can be more expensive. Knowing your market (e.g. competition, 7ps, audience and buyer personas) will definitely help to choose your strategy. Mapping out your marketing strategies month on month will help achieve your targets using key elements of online (e.g. through owned, earned, paid) and offline (e.g. tv, print) marketing. Translate the website (if necessary)? Consider that all roads lead to Rome (“Tutte le strade portano a Roma”); there are different ways to reach the same goals. Your plan will depend on what you want to achieve within a given time frame and budget available. The rule of 7 is a marketing theory that stipulates that consumers need to be showed a message at least seven times before becoming aware of an offer and make a decision to purchase. I have underlined the “at least” as with the plethora of information nowadays it often requires additional exposure for a message to be effectively listened to and taken into consideration. A multi-channel strategy with offline and online messages is necessary to maximise your return, to outclass your competition and to reach your audience. Consistency is key and reinforces the power of your message. Again, the choice of channels will depend on your strategy and the budget you have available. There are various studies highlighting the prominence of online marketing and the share of budget spent online is continuously increasing (e.g. online video, social media etc). The growth of digital may (or may not) have impacted traditional marketing. New channels only create new ways to reach your market audience. Online and offline can work together to achieve your objectives. The first question is “do I have budget available and a strategy with it?”. For instance, budget can be a share of the revenue or a fixed cost. This will be decided overtime and defined by the nature of the business and the buying process. Most small businesses allocate 7% to 12% of their total revenue to marketing. 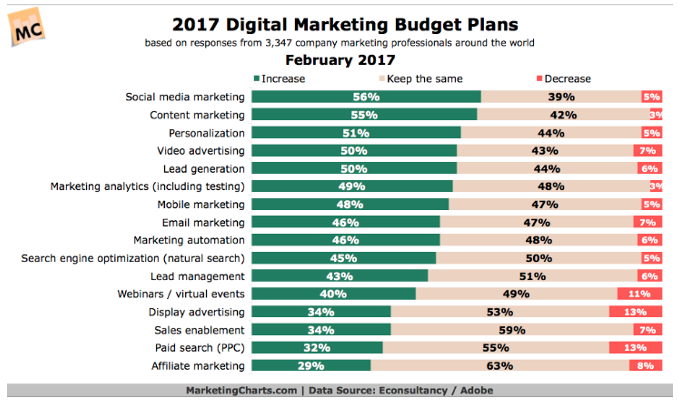 Below is a chart that shows digital marketing budget plans around the world in 2017. Testing is a prerequisite in marketing and without it you cannot find out whether a channel is right for you. It is important to keep in mind that what works for your competitor may not work for you (or work better). Timing is another determining factor (too late or too soon) that will contribute to the success of a campaign or its failure. For instance what works in one country might not work in another due to market maturity/product life cycle. It is reasonably easier to attribute value on online marketing (measurable and pretty accurate return on investment) than TV or Print advertising. And it is reasonably easier to attribute value on Paid Search campaigns than Conversion Rate Optimisation projects for instance. However, it is important to keep in mind that all channels are correlated and support each other to reach a final goal: customer satisfaction and sales.